The Palmer Park Tennis Academy (PPTA) is aimed at exposing Detroit urban youth to the sport of tennis, using USTA 10 and Under Tennis. 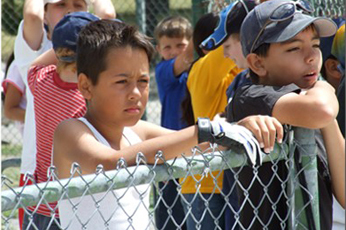 The summer of 2012 was the first year of the PPTA tennis program with 38 students between the ages of 5-10. The goal of PPTA is to have as many Detroit youth as possible learn to love tennis and hopefully develop to play at a higher level, so that in the future PPTA becomes known as a program that produces well-rounded, tennis players, who are healthy productive members of society. Established in 2010, the People for Palmer Park (PFPP) is a 501c(3) organization committed to the preservation and revitalization of Palmer Park - a 296 acre public park in the City of Detroit. With continued city budget cuts threatening the existence of Detroit’s 77 Public Parks, city leadership encouraged creative solutions from citizens to keep Detroit's parks alive and healthy. Leonora King (PFPP Board Member who grew up playing tennis in the City of Detroit and went on to become the first African American Tennis Player at Western Michigan University) called upon local tennis players to come to the Palmer Park courts in a show of support. Not only did tennis players show up, but other community organizations, park groups and citizens came, turning it into a 300+ person community rally – and the People for Palmer Park began. Select "Support MY District Programs" when making a donation.